If asked who my heroes were when I was eight years old, James Horner’s name would have been on a very short list of film composers whose work I adored. My cassette tapes of his soundtracks to Star Trek II, Star Trek III, Aliens and Willow wore down over endless repeat plays. Taking my mother’s VHS camcorder, I recreated Star Trek II scene by scene, using toys and puppets against a set I made out of a cardboard box, just so I could hear his score against it! Horner’s rich orchestral writing and thematic development ignited my imagination on long car trips, while walking to school, or while simply sitting in my room in front of my stereo. As I grew, so did my understanding of his music. In high school, some of my favorite scores were Sneakers (which I arranged for my high school band), The Rocketeer (which I later analyzed for my college thesis), and of course, Braveheart, a film I saw in theaters a dozen times. The lyrical bagpipes, lush orchestration and contemporary synthesis in Braveheart spoke to me on a fundamental level, becoming etched into my soul. Horner’s music is unpredictable harmonically, rich texturally, and satisfying melodically. He knew what the audience wanted, and when to give it to them. Ultimately, there is no higher praise one can give a film composer. 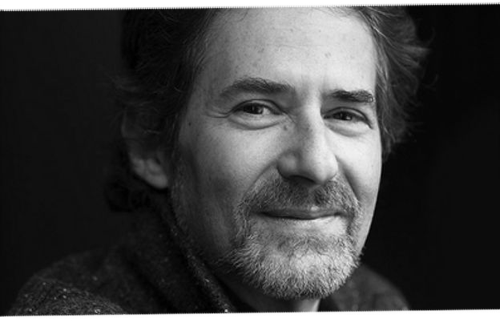 James Horner is one of a handful of composers whose work started me on my path. I cannot imagine my life today being the same without his music weaving through my earliest memories. Learning of his tragic death yesterday, I was overwhelmed. I wept openly, something I have never done before at the loss of someone I did not know personally. Mine were tears of sadness that he has left us before his time, and tears of immeasurable gratitude for the impact he had on my life. 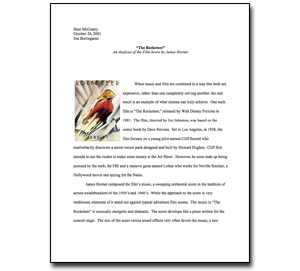 I mentioned in my tribute that I wrote a paper analyzing Horner’s score to The Rocketeer when I was in college. This was my final assignment for Jon Burlingame’s film history class. I went back and read it again today. It was my first experience writing about composing. To my surprise, I think it actually led into what would become my blog entries about my own work. Sure, looking back today at my then analysis and writing style makes me cringe just a little, but I think my passion for the score to The Rocketeer is evident. Since my tribute went up yesterday, a few people have surprised me by expressing interest in reading my paper, so I am posting it here for anyone curious. Click on the image or this link to view it or download it.